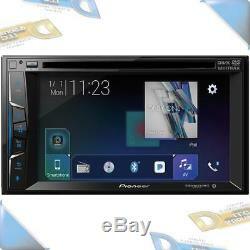 Pioneer 6.2 Double-DIN In-Dash DVD Car Stereo w/Bluetooth/SiriusXM Ready. 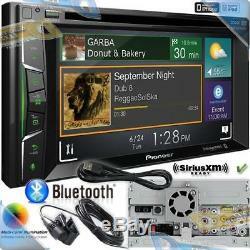 Double-DIN In-Dash DVD Receiver with Bluetooth is SiriusXM-ready. So you can add satellite radio tuner. And if you decide you want to add a backup camera, this head unit has the dedicated input so you can view the camera on the touchscreen. 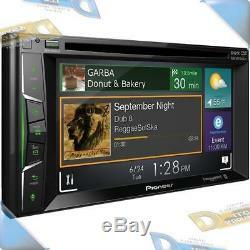 The system has an amazing feature set, making it an ideal centerpiece to your car stereo system! Play DVDs, CDs and tunes from your MP3 players and smart devices. You can even enjoy FLAC hi-res audio files in your car! Make those miles fly with Pioneer. Display & color customization - 5 Display Colors, 112-Key Colors. Hands-free calling & audio streaming. 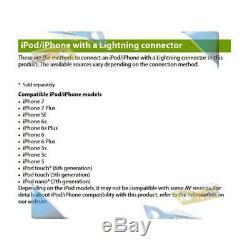 USB direct control of iPhone/iPod via optional cable. AppRadio Mode + displays smartphone's compatible apps on dash via optional USB cable. Dedicated Spotify App Control A/V source controls content from iPhone & Android devices. Works with Pandora Internet Radio. Compatible with free AppRadioLIVE downloadable app. MIXTRAX takes the music from iPhone/iPod, USB device or certain Android devices & plays it back with added transitions & effects to create a virtual DJ inside the Pioneer receiver. Three 4V RCA preamp outputs. 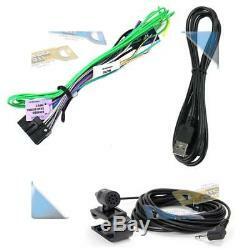 Includes wiring harness, USB extension cable, Bluetooth microphone & manual. With AppRadio Mode +, Pioneer has taken the technology from our revolutionary, game-changing AppRadio and placed it in this receiver so you can experience control of compatible apps directly on your dash! When connected to an iPhone 5 or newer, or compatible Android smartphone via USB interface cable and loaded with Pioneer's free AppRadio application, you can enjoy full on-screen access and control of your contacts, calendar, maps, and more! The intuitive interface is formatted and designed specifically for safer in-vehicle operation. Pioneer has teamed up with app providers to offer compatibility with some of today's most popular in-vehicle apps, while also developing an expanding catalog of compatible apps for future features and functions that can be easily and seamlessly added. AppRadioLIVE simplifies your drive by combining the information you need during your commute into a single, simple to use interface. It's YOUR digital lifestyle connected. It was specifically designed based on feedback from our current AppRadio customers and offers quick and easy access to personalized information needed in the in-vehicle environment including: Maps, Media, News and Calendar. AppRadioLIVE pulls content from many different sources and services which you likely already have an account with. All you have to do is download the FREE AppRadioLIVE app and sync your services. All you information saved on those accounts will be pulled into the AppRadioLIVE interface. When a registered Bluetooth device is in close proximity to the receiver, the auto connection function automatically pairs the two units. From hands-free calling, wireless audio streaming (A2DP) with artist, album, and song search, simple pairing, and control audio (AVRCP), Bluetooth® wireless technology has made life in the vehicle much more convenient. This receiver with Bluetooth also includes better call quality reception using the new Wideband Speech Handsfree Profile 1.6. Wideband Speech nearly doubles the bandwidth of frequencies of a normal bluetooth call. Other features include the ability to browse music libraries on smartphones wirelessly. Pandora is personalized internet radio that is designed to help you discover new music that you'll love mixed in with music that you already know. With the AVH-500EX, you can enjoy superior sound quality and full control of the Pandora experience in your car directly from the touchscreen display of the receiver. Compatible with Apple iOS, as well as Android devices that support the Bluetooth Serial Port Profile (SPP). Simply download the free Pandora Radio app to your iPhone or Android device and connect to the AVH-500EX and take your music to the next level. For more information and to sign up for a free account, visit the official Pandora website. With Spotify being a dedicated A/V source on the receiver, you now have the ability to control content from the Spotify app on iPhone and Android devices. You can play, pause and skip tracks, and browse playlists, albums and radio stations on the go using the Pioneer controls. If you are a Spotify premium user (requires a monthly paid subscription). You can enjoy ad-free, high quality music downloaded to your smartphone even when there is no internet connection. Power of SIRI eyes Free. Users of an iPhone® with Siri can take advantage of Siri Eyes Free functionality. With a simple touch of the touchscreen, Siri starts listening through the unit's external microphone and answers your questions and requests over the vehicle's speakers, helping you keep your eyes on the road and your hands on the wheel. Your Favorite Stations Wherever You Go, Wherever You Are. The unit is SiriusXM-Ready® so you can get over 140 channels, including commercial-free music plus the best sports and live events, comedy, news, exclusive talk and entertainment. Keep your factory features and expand your level of in-vehicle connectivity with Pioneer NEX and iDatalink Maestro RR. The receiver supports factory functions via the iDatalink Maestro RR including: Steering Wheel Controls, Media Player (including the factory AUX-in and USB ports), Hands-Free Telephone, Voice Commands, Satellite Radio, and Secondary Display Support. Keep the party going with MIXTRAX®, an innovative Pioneer technology that creates a non-stop mix of your music library complete with a range of DJ-inspired effects. Drawing from Pioneer's rich DJ heritage and our passion for music, MIXTRAX delivers a unique DJ infused listening experience to those in the car. MIXTRAX takes the music from an iPhone, iPod, USB device, or certain Android devices and plays it back with added transitions and effects, creating a virtual DJ inside the Pioneer receiver. MIXTRAX makes automatic remixing of tracks extra-quick and easy. Simply connect your USB compatible device and listenas tracks are joined by various random sound effects in non-stop-mix play to keep the groove going in full swing. MIXTRAX also features club-style illumination that enhances the mood with a dynamic dance club-like lighting effect. As MIXTRAX begins, lights start pulsing to the beat of the music, adding an extra level of entertainment. Choose among multiple patterns of lighting variations from sound pressure level or low-pass synchronization modes. USB Direct Control for iPod/iPhone. Song, artist, time and album information are beautifully displayed on the 6.2 touchscreen. Powerful searching tools such as Link Play and Alphabet Search to help you find content faster. The system's wired USB connection provides direct digital signal transfer from the device for clean, clear sound while providing 1.5 amp of current to keep your iPod/iPhone charged. More advanced than ever before, the unit features a responsive, powerful and intuitive touchscreen user interface that is easy to use and highly customizable. Clearly, this multimedia receiver is designed specifically for today's smartphone and tablet-driven lifestyle. Connect your compatible iOS or AndroidT smartphone with the receiver for a truly connected experience, bringing many of your favorite apps right into the dashboard and letting you communicate using advanced high quality Bluetooth connectivity. In addition to playing numerous sources and file formats, Pioneer's AppRadio® Mode allows you to bring many of your favorite apps right into the dashboard. This unit features built-in Bluetooth® that enables both hands-free calling and audio streaming. Including the latest Hands-Free Profile (HFP 1.6) with Wideband Speech capability, the receiver provides more natural sound quality and details during calls. When streaming music, the unit even lets you browse and select the media stored on your smartphone using the AVRCP 1.6 profile. Your car and your music are as unique as you are. With the Pioneer in-dash digital media receiver, sound quality features like built-in Auto EQ and Time Alignment, 13-Band Graphic Equalizer with touch panel swipe settings and built-in high/low pass crossover with adjustable points and slopes provide you with the controls to tailor the listening experience to your vehicle and listening preferences. Your love of high-res audio does not need to stop at the front door. Now for the first time in an aftermarket car stereo, you can enjoy FLAC files in your vehicle without the need to convert. Pioneer's compatible in-dash receivers are the first in the industry to offer playback at CD quality of files encoded as hi-res FLAC up to 192kHz/24 bit. With Pioneer, your high-res FLAC is no longer confined to your home hi-fi system - put your music on the move. Brand new sealed in Retail Packaging. 11.1" L x 9.6" W x 6.3 H. English, French, Portughese, Simplified Chinese,ish. Product does not require a battery. 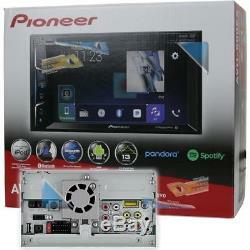 Item: Pioneer 6.2 Double-DIN In-Dash DVD Car Stereo w/Bluetooth/SiriusXM Ready. 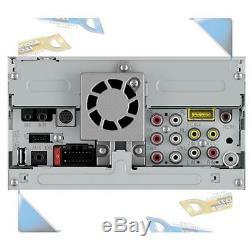 Product Listing Category: Car Audio In-Dash Units. 50 States (NO PO BOXES, APO/FPO). Peak/Holiday periods are expected increases in volume, and duly we cannot possibly be in direct control or responsible for occurrences such as Severe Weather Delays, Carrier Volume,'Acts of God' etc. There are no exceptions to these policies. In order to process a valid Return request for all return-eligible items, these minimum requirements must be met. All original packaging and accessories manuals, cables, etc. Are intact along with the item. Product exchanges are allowed for equal or greater priced item only. Customer pays difference if higher priced item. By purchasing products from our company, you are asserting acknowledgement agreeing to a legally-binding commerical Business-to-End User/Consumer contractual purchasing agreement. The binding and non-binding parties agree to all the preceding above-stated and as follows below in these Terms of Sale. For purposes of this Agreement, "E-Commerce" means sales of products by D. & Sons, LLC's websites, or any online system or computer network. E-Commerce' also includes any related business and marketing activities supporting such sales. The Term of this Agreement begins on the Effective Date (noted above) and remains valid indefinitely until either: (1) D. & Sons, LLC and said E-commerce platforms and Marketplaces shall be and remain the sole property of D. Plagiarism, Intellectual Property Theft, or any other forms Trade Dress violations or similar where valid under law is strictly prohibited. SHALL INDEMNIFY, DEFEND, AND HOLD HARMLESS D. & SONS, LLC TO COMPLY WITH THIS AGREEMENT; (B) NEGLIGENT OR GROSSLY NEGLIGENT ACTION, INACTION, OMISSION OR INTENTIONAL MISCONDUCT OF D. The laws of the State of Colorado and Nevada govern this Agreement and any disputes arising hereunder. Except injunctive or other equitable relief, D.
If mediation is unsuccessful, the parties agree to submit disputes to state or federal court in Denver County, Colorado, USA, and/or Clark County, Nevada, USA. This Agreement constitutes the entire agreement between all prior, above-named parties with respect to the subject matter hereof, and supersedes any and all prior or contemporaneous agreements, understandings, negotiations, representations or proposals or any kind, whether written, oral or otherwise. Neither party has relied upon any statements, representations or other communications that are not contained in this Agreement. Order Online 24 hours a Day, 7 Days a Week, 365 Days a Year. The item "NEW Pioneer 6.2 Double-DIN In-Dash DVD Car Stereo withBluetooth/SiriusXM Ready" is in sale since Saturday, April 21, 2018. This item is in the category "Consumer Electronics\Vehicle Electronics & GPS\Car Audio\Car Audio In-Dash Units".llc" and is located in D.